Mashable reports that Paramount Pictures sent a letter to Twitter themselves claiming a copyright violation. As of this writing @555uhz is still up, but has not put out any new tweets since yesterday. "No one is authorized to copy, reproduce, distribute, or otherwise use Top Gun without the express written permission of Paramount," the letter read. 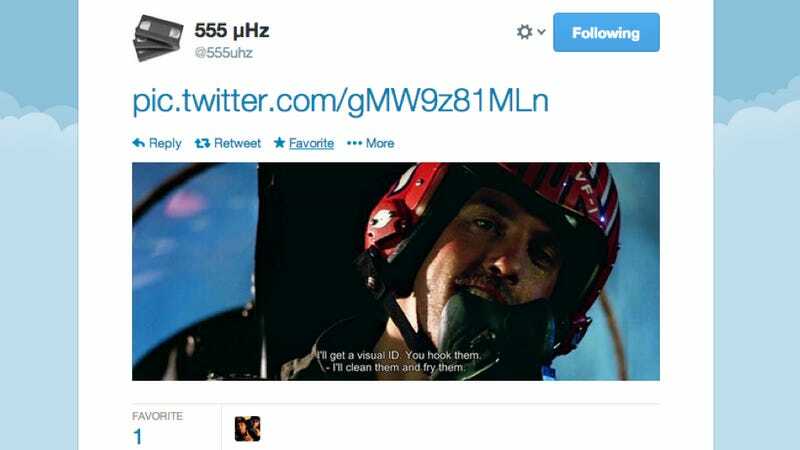 "We request that you immediately remove all the Top Gun images from this website relating to the @555uhz user account. We further declare under penalty of perjury that we are authorized to act on behalf of Paramount and that the information in this letter is accurate." That's kind of a bummer, isn't it? I understand where Paramount is coming from, but it's not like you could conceivably watch the movie like this. It would take forever, basically. Whatever. You can be my wingman any time, @555_uhz.